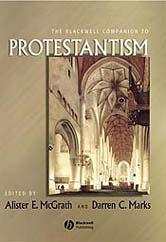 Editor/Author McGrath, Alister E. and Marks, Darren C.
This Companion brings together new contributions from internationally renowned scholars in order to examine the past, present and future of Protestantism. Co-edited by leading Protestant theologians Alister E. McGrath and Darren C. Marks, with contributions from internationally renowned scholars. Opens with an investigation into the formation of Protestant identity across Europe, North America, Asia, Australasia and Africa. Includes coverage of leading Protestant thinkers, such as Luther, Calvin, Schleiermacher and Barth. Considers the interaction of Protestantism with different areas of modern life, including the arts, politics, the law and science. Debates the future of Protestantism in both Western and non-Western settings.